It’s the end of an era for the only privately run ski school at a major resort in Canada. He’d ride up the mountain first thing to work on his carving technique while his cronies were sleeping off their hangovers. He sweated in a steel mill to pay his way through university. He was born in the East, spoke French at home, learned to ski in New York State then fell in love with the West, making his career and raising his family in the mountains of BC. He has owned a dude ranch and a restaurant, marketed and run ski resorts, and dragged an old log cabin up a mountainside behind a roaring bulldozer. And through a 42-year career of teaching, coaching, mentoring and writing he has helped thousands become better skiers. 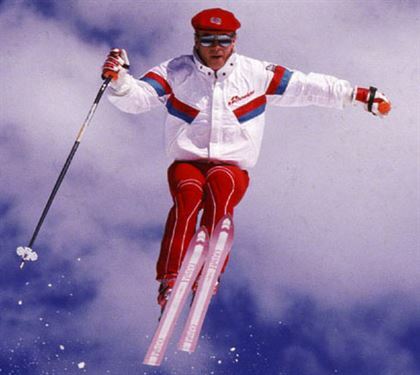 His colourful ski-improvement articles —headlined by aphorisms like “Ski with Passion, Turn with Precision ” and “Ski Dynamic, Be Dynamic” – graced the pages of Ski Canada for 23 years. But this winter Don Bilodeau is carving it up purely for fun. He and Heather, is wife of 29 years – and his business partner, skiing inspiration and muse – have relocated to Savary Island on BC.’s Sunshine Coast. Following Intrawest’s sale of Panorama Resort last year, they have wound down their popular Ski Pro Workshops and the Bilodeau School of Skiing and Snowboarding. But the effervescent couple – Don turned 60 in August, Heather is 51 – are hardly sitting in rockers on the porch. They’re sailing the lovely waters around their new home, have bought a business in Powell River and are planning to apply their unique teaching model to activities other than skiing. “We were the only independent-contractor ski and snowboard school in Canada of any significance,” Don recalled in a lengthy interview last summer. “We had our own program, we were able to innovate and be entrepreneurial and keep the quality up.” But while Intrawest had maintained the business relationship for many years, the Bilodeaus were seeing ominous changes engulfing ski resorts. “A lot of what we do is based on individualized nteraction with our guests, and much of that was being lost in other ski schools,” says Bilodeau. “The destination resorts have now come under financial pressure, and the trends are becoming evident.” The independent school’s days were clearly numbered. and so, says Don, “We began planning a way to move out at the top of our game and on our own terms, with integrity and a good reputation. It’s the right time to move forward to new challenges.” Following their school’s shutdown, the couple’s famous mid-mountain Elkhorn Cabin – the one Don dragged up Panorama’s slopes more than a decade ago – is for sale. Bilodeau was born into a French-Canadian family in Quebec City. When Don was two they moved to the then-thriving manufacturing hub of Buffalo, New York, where Papa Bilodeau found work as a tool and die maker, somewhat safer profession than professional dirt track motorcycle racing. Don credits his father as his inspiration. Bob Bilodeau had become a champion in Quebec and New England driving brakeless Indians, Triumphs and Harleys at 80 miles an hour before retiring and starting a family. And Don still rides a rebuilt, vintage 1968 Triumph Bonneville. “In high school I became totally passionate about skiing, ” recalls Don. he learned at tiny hills like Kissing Bridge and one of New York State’s hundreds of lost ski areas, Happy Valley. After high school she got nto the small but exclusive Alfred State College and University in upstate New York, raising the steep tuition by sweating away in a gigantic Buffalo steel mill, where he “dreamed of snow in the red-hot conditions.” His skiing “really kicked in” when Don became a paid ski patroller at Happy Valley: “I’d patrol from 4:00-10:00 every evening. l also joined the race program – it was the smallest college team in the U.S. northeast – but by training hard we regularly beat the big schools.” Back then, ski racing included nordic and jumping, and Don’s first-ever jump was in a competition, his “loose heels shaking with fear.” He graduated with degrees in business administration and accounting. From here, Don’s career took off. In 1972 he got a job at Mont Tremblant where, armed with his Level IV instructor’s certification, he bypassed snowplowing purgatory and went straight into teaching advanced skiers. 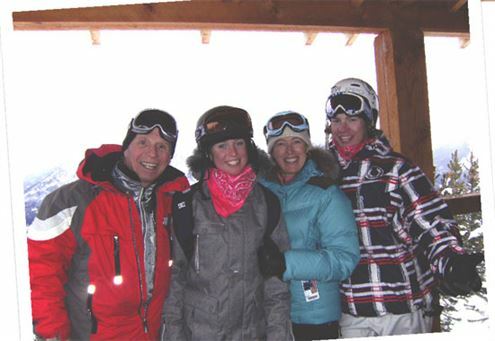 Barely into is mid-20s, he became director of skiing at Blue Mountain in Ontario, where he ran a 100-member ski school. In 1980 Don made the Canadian Ski Instructors’ Alliance’s (CSIA)) demo team, headed by André Schwarz. Now the owner of the distinctive Post Hotel at Lake Louise, Schwarz was a genuine visionary who drove major technique and style changes in CSIA doctrine – such as purging upper-body over-rotation in favour of a quiet upper body facing down the fall line. helped sell the ideas in Movement in Motion.” Bilodeau was also becoming well known to the skiing public, writing a syndicated newspaper column read by hundreds of thousands. His demo team involvement led him to cross paths with brilliant young skier from Thunder Bay: Heather Ritchie, who had just made the demo team. It was the most important event in Don’s adult life. After skiing and working together, they fell in love over the following year, and she persuaded Don to come West for good. They married in September 1981. “We took our VW Van to a little place in BC called Invermere,” recalls Don. After a few years as ski school director at Lake Louise, he took on the role of Panorama’s vice-president of sales and marketing, as well as GM of the small ski area at nearby Fairmont Hot Springs resort. At Panorama the couple created the unique model that would define their next two decades. The Ski Pro Workshops were initially conceived as a way to develop early- season business for the resort by bringing in weekend ski instructors from the East for pre-season mprovement. The intense camps blossomed into a large following of repeat clients. “It went beyond the typical open-ended improvement sessions,” says Don. “It was based on one-on-one personalized interaction combined with very high-quality instruction from Level IVs, using specific drills that I controlled – with a lot of skiing time.” The camps included a lively social dimension that knitted the acolytes together. “Don and Heather became an amazing team,” recalls Olson. “Don would never miss a chance to do something new, while Heather was incredibly organized. So it surprised no one when they got a ski school concession, which was every wage-earning manager’s dream.” While Don’s direct influence over the CSIA’s evolution waned, he and Heather touched thousands of skiers. “They ski so beautifully and with such obvious success, that people wanted to learn to do what they did,” Olson says. “They influenced a lot of people one-on-one, and that was their real impact on Canadian skiing.” Don was recently inducted into the CSIA Hall of Fame. Heather was central to the school’s success, says Don. “She paid a lot of attention to creating a culture that would provide the best guest experience. Heather’s the fire and the passion in everything we’ve done. She’s the real master of instruction, although she doesn’t teach people through technical terms, she does it through feelings, analogies and speaking in a language people understand. Her skiing is like water running through pebbles. She’s been called a ‘Ski Whisperer’ for her ability to motivate people and help them break through.” The couple’s approach worked. This magazine rated it Canada’s best ski school, and an independent U.S. market survey of North American ski resorts picked it as number-one in guest service. That became a huge cultural and psychological boost to the school, Don recalls. From Left: Don Bilodeau, guest, Heather Bilodeau, guest. Bilodeau was also a valued contributor to Ski Canada, writing perhaps 100 three- to four-page ski tip articles. In the early years he worked on an Underwood typewriter and mailed in his photographic slides by longtime ski photographers Scott Rowed and Alec Pytlowany in After Eight chocolate mint slips. “The driving theme was keeping it simple while maintaining the fun and passion,” says Don. One randomly selected article (from November 1998) was indeed about skiing with passion. Featuring tips on making “cutting turns” and “flying turns,” it exhorted the reader, “When you’re passionate and discover how to play with gravity using your boards and the snow, you’ll inevitably ski with more precision.” Thousands loved this non-technical approach. “I got a lot of feedback to the articles when I went to ski shows, and it was a terrific feeling to hear someone say, ‘I finally understand how it works because you simplified it,” says Don. Heather was a regular presence in the articles, as were children Stuart and Hannah (now 25 and 22, respectively) in the later years.